Unlucky in love once again after her sort-of-boyfriend/possible-marriage-partner-to-be proves a little too close to his parents, Sofia Khan is ready to renounce men for good. Or at least she was, until her boss persuades her to write a tell-all expose about the Muslim dating scene. As her woes become her work, Sofia must lean on the support of her brilliant friends, baffled colleagues and baffling parents as she seeks stories for her book. But in amongst the marriage-crazy relatives, racist tube passengers and polygamy-inclined friends, could there be a lingering possibility that she might just be falling in love . . . ? When January rolled around I found myself craving a bit of contemporary fiction; it's not a genre I read often, so when I'm in the mood for it I usually end up devouring it, as was the case here. I discovered Sofia Khan is Not Obliged on Leena @ justkissmyfrog's YouTube channel (a channel which you should totally be following if you're not already) and I wanted to check it out for myself. There's no shortage of contemporary novels starring women working in publishing, but I'd never read one in which the protagonist is Muslim. In fact the more I thought about it, the more I realised I'd never read a contemporary novel in which the protagonist is Muslim. Considering I don't read much contemporary I suppose I can give myself a break, but other than the Ms. Marvel comics I don't think I've read any other books, regardless of genre, which feature Muslim protagonists. Note to self: Fix this. One thing I love about Sofia Khan and Ms. Marvel is that they're both also written by Muslim women, which is an added bonus. I'm not of the opinion that people can only write about characters like themselves - yes I think more trans authors writing about trans characters should be published, for example, but I don't think that means only trans authors can write about trans characters - but it's refreshing to read about a Muslim woman written by a Muslim woman, especially when so many Muslim narratives in fiction feature breaking away from tradition. 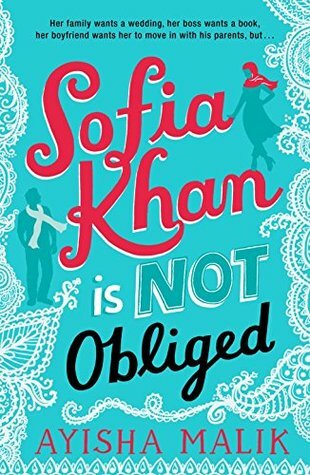 What I really enjoyed about Sofia Khan is Not Obliged is that Sofia is a practicing Muslim. She wears a hijab not because anyone is forcing her to, but because she chooses to wear it. I can't express how important this is when we live in a society that keeps trying to tell women who wear a hijab that they're being oppressed; as someone who is white and agnostic, it's none of my business what a practicing Muslim woman decides to wear. Even if I were Muslim, it'd still be none of my business. God is very important to Sofia, but don't let that put you off this book; it's not trying to convert you to Islam, it's simply Sofia's story, and Sofia just so happens to be Muslim. Outside of her faith she's like any other woman: she's not quite sure where her life is going, she doesn't know if she's in the right job, she's pretty sure she's going to be single until the end of time, and she's just a bit lost. Ultimately this book went in a direction I wasn't expecting; it started out as a Bridget Jones kind of rom-com and then became something a little more serious which, given Sofia's journey throughout this book, makes a lot of sense. However, sometimes the tone felt a little obscure because of it, leaving me not quite sure what kind of book I was reading. Having said that, I love that Malik tackled some more serious topics in this book, that she didn't let the genre she was writing in, a genre that's so often met with derision, dictate the kind of story she was going to tell; in many ways Malik's writing process and Sofia's are fairly parallel. Basically this book ticks a lot of boxes; it's funny, heartfelt, and thoughtful, and I'm definitely interested in checking out whatever Malik releases next. I found this book on Goodreads a few weeks ago, and it looked really interesting. Glad to see that you liked it! I think it's what I'll be picking up next time I'm in the mood for a contemporary. Oh I definitely need to check this one out. I haven't read a lot of books about Muslim protagonists either, and I definitely want to read more stories about people from different cultures and backgrounds.